This project addresses the basic molecular mechanisms responsible for the acclimation of the photosynthetic apparatus to changes in irradiance. We have recently identified that the redox status of the plastoquinone pool is a sensor that affects nuclear gene transcription in a eucaryotic green alga, Dunaliella tertiolecta (Escoubas et al., Proc. Nat, Acad. Sci. 92:10237-41). The research builds on that discovery by analyzing the signal transduction cascade and the cue/response functions. 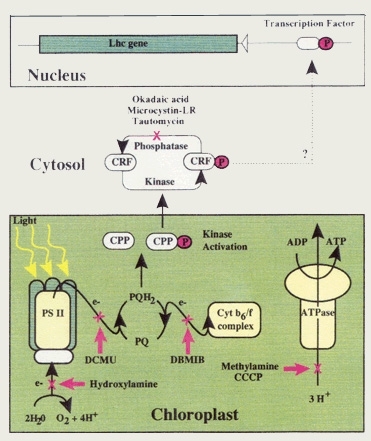 The effect of redox modulation in the photosynthetic electron transport chain on the expression of a variety of nuclear genes is under investigation. The research goals are to characterize the key DNA binding factors, follow the effects of redox control on the activation of the binding factors, and examine how redox poise is related to environmental cues such as irradiance, temperature and CO2. chloroplastic photoreceptor, the plastoquinone pool. The research has broad implication for understanding how environmental information is transduced to biochemical information with photosynthetic organisms, and how that information, in turn, affects nuclear gene expression.